Here is another photo of Julie taking photos, with a backdrop of a thicket of mangrove roots at the mouth of the Langosta Estuary. They give tours of the Tamarindo Estuary, on the north side of Tamarindo, which is part of the Las Baulas National Marine Park. The Langosta Estuary is on the south side of Tamarindo. The estuary tours take a small boat into the upper reaches of the estuary, where its fingers narrow to the width of a small stream, with dense mangrove thickets on both sides. I commented yesterday about how I had only my little camera rather than my DSLR for the photo I took yesterday. Why? Because Julie was with me and she had the good DSLR, of course. This photo shows Julie wading into the soft sand of the estuary for photos. I now also have a good DSLR (a Nikon D90). Why? Because Julie got an even newer Nikon. The little camera I used for yesterday's photo also used to be Julie's. It became my camera when she moved up to the D90. Now that you know the pecking order in our family, you can guess how I got the computer on which a posting this photo blog. Yes, it used to be Julie's. And the car I drive? Used to be Julie's. But with one exception, I am not complaining. My complaint? Julie's computer had a neon, hot pink case. Once a little girl sitting next to me on an airplane commented "You need to get a boy computer." I now have a second computer case. This is a little pile of shells in the tidewater at the mouth of the Langosta Estuary. No, I did not create this little pile. It looks like the crabs that carry these shells on their backs were playing a version of the childhood game of "king of the mountain" to see who could climb up on top. The crabs and mossy rock or coral are not attractive enough to make this a very appealing photograph, but this does illustrate a classic photographic technique to add depth and interest to a landscape photo. I took this photo with a small camera that has a maximum f-stop of 8, which I was surprised still did a decent job with an extreme depth of field challenge. The advantage of using that little camera is that it has a tilt LCD viewfinder screen. That comes in very hand for photos such as this, as I can put the camera down near the ground and look down into the screen. On my good DSLR, I would have to lie down on the ground to see the screen, or take several photos guessing at what is visible through the lens. I have not posted a photo of a sunset in a while, so here is a photo of the sunset from the balcony of our Langosta Beach condo. I positioned the camera behind the little palm trees so soften the sun. I like the "Green Season" at this time of year, as the clouds add shape, texture and capture the color of the sunset. The high season of sunny, cloudless skies during November through April is ideal for tourists who want to escape the cold weather up north. News: Here is a little news item from the Costa Rican newspaper. The first Costa Rican to climb Mount Everest has just reached the summit. Congratulations to Warner Rojas. The newspaper has been reporting on the progress of his expedition by monitoring his Facebook page. They have reached the summit and returned safely to one of the camps below. Julie and I where in the Himalayas several months ago, although not for mountain climbing. But this is a tremendous achievement and a source of price for a country like Costa Rica, which has mountains, but none of them covered with snow and ice like Everest. A short time after the girl in yesterday's photo was crying, I spotted her in a much better mood. It looks like her father is giving her lessons on how to hold her nose when she puts her head under water. Good fatherly advice. Today is Sunday, so we have new photos posted on our Viva la Voyage travel photo site. This week we are showing photos of the elegant villas and gardens on the Borromean Islands in Lake Maggiore, Italy. Children love the beach, of course, but this little girl was upset about something. Maybe there was sand in her sandals. But don't worry. She did not stay upset for long. We are showing photos featuring the industriousness of the Egyptian civilization and people this week on on our Viva la Voyage travel photo site. The dog that I showed yesterday and the day before stopped for a rest on the beach. He looks happy and proud of himself. The ocean breeze was blowing his hair, similar to the way fashion photographers sometimes use fans to blow the hair of models. The dog I showed yesterday made a quick pivot like an American football running back, to chase down a stick thrown for him. This photo shows him proudly returning with a stick that seems a little large to for this game of fetch. Dogs love the beach as much as children. This dog is obviously enjoying his run. As the position of his legs suggest, he is making a quick change of direction. Tomorrow I will show you why. I am showing one more photo for this series of the two surfers who walked by as Julie and I were taking some photos on Playa Langosta. I don't have any photos of women in bathing suits on the beach lined up, for gender equality, but tomorrow I will begin a few days of photos of something that I think men and women will find equally appealing eye candy on the beach. This photo shows the same two surfers that I showed yesterday. I took a quick photo and then noticed that Julie was oblivious to them, as she concentrated on taking a picture of a crab or something in the sand, as I showed yesterday. I kept engaged with the scene as they approached so I could get yesterday's photo. This shows he benefits of two photographers shooting the same scene. We see different things. I think Julie missed the better photo opportunity presented by this moment. A few days ago I showed some photos of Julie intent on taking a picture of a baby iguana. Here, she is concentrating on taking a photo of something on the beach. I don't know if it was a crab. I think my women readers will agree that she was missing better photo opportunity, as I will show tomorrow. Today is Sunday, so we have new photos on our Viva la Voyage travel photo site. This week we are showing photos featuring the industriousness of the Egyptian civilization and people. This photo shows how much better it is to get down on the same level as a small animal, rather than shooting down on it. I was able to get the ocean in the background. I also tried to frame the iguana with the water behind his body rather than the darker rocks, as the rocks would provide less contrast to the color of the iguana. 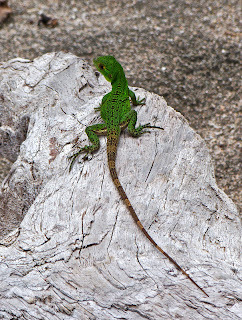 The challenge of this photo was the depth of field because I was only a few feet from the iguana, and the ocean was well outside the camera's depth of field. Also, Julie was using our good camera, and I had our older camera which, although it has a 15 times zoom, has no setting higher than f 8, so its depth of field is very limited. But I can also pretend that I wanted to blur the background so that it does not distract from the subject. This week we are showing photos of the Atacama desert in the Andes Mountains of northern Chile. It is a unique landscape. 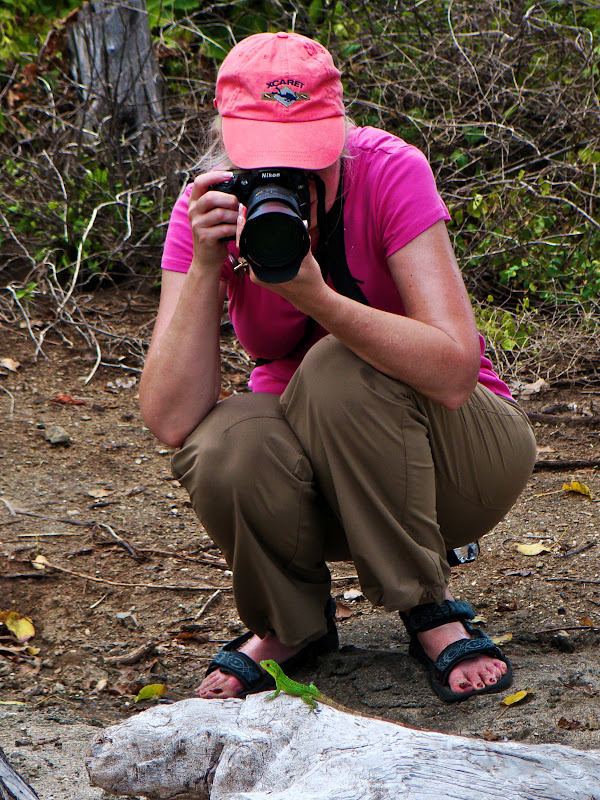 While Julie was taking a photo of the iguana from the front, I changed the subject of my photos from Julie to the iguana and moved in from behind. His tail is about twice the length of his body. Julie and I enjoy photography together, and we often get different angles of the same subjects. And of course we have a friendly comparison, not a competition, regarding which photos we like better. Tomorrow I will show you my favorite angle on this baby iguana. OK. My last coupe of posts were a tease. 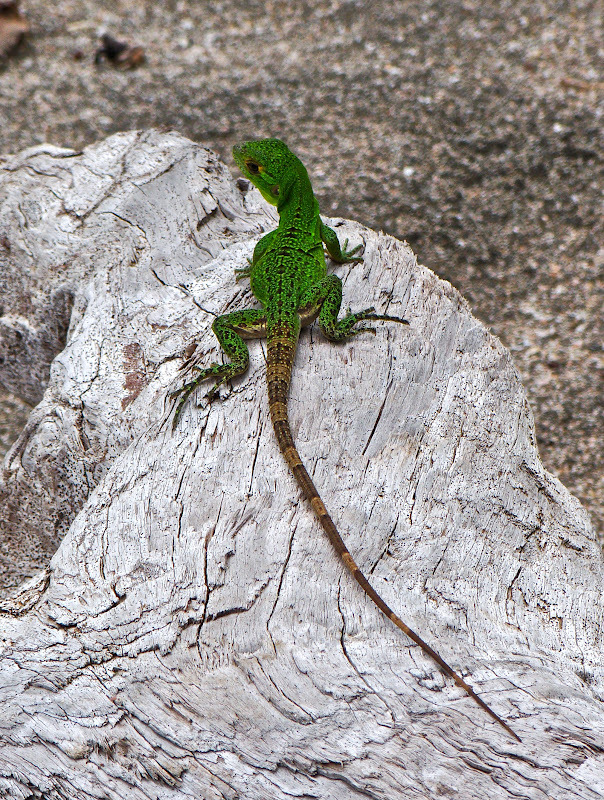 Here you can see that Julie has found a baby iguana exposed and posing on top of a driftwood log. Usually we see baby iguanas under the branches and leaves around our condo building. This little iguana must be brave to stand his ground even when large people are close by and pointing camera lenses at him. This photo also shows Julie's dedication to getting a good photo. Julie has had several knee and ankle surgeries. This low crouch might be good for a camera angle, but it cannot feel good on the knees. Julie was concentrating on something on the end of this driftwood on the beach near our condo. I figured it must be an animal, and I was right, as I will show you in the days ahead (and as is barely visible in this photo). As Julie and I were walking along the beach next to the driftwood that I showed yesterday, I noticed that Julie was taking a photo. Obviously that is a signal to me to see what she was photographing, although sometimes I prefer to photograph her taking photos, as that is a common sight on our travels. One of these years I think we will do a series, or maybe even a photo book, of pictures of Julie taking pictures around the world. Of course I will show what she was photographing in the days ahead. Our Langosta condo building is in the background. Here is another photo of driftwood that has washed up on Langosta beach. This log appears to have been adrift in the ocean for quite while, as it is rather eroded. Our area of Costa Rica has forests along the beaches and estuaries. That produces driftwood at times along our stretch of beach. Here is an example. This was a big tree, now the little logs and sticks that one typically things of as driftwood. Today is Mother's Day in the USA, although in Costa Rica Mother's Day is in August and is a national holiday. I want to give a brief tribute to Julie's mother, Glenda, and to my own late mother. My mother passed away about a dozen years ago. She was a social worker and educator with two master's degrees and a Ph.D., not common for women of her generation. She subordinated her career to my father's life as an officer in the US Navy, which required frequent relocation to distant places. She remained actively supportive of my brother and me throughout her life, long after my father told her it was time to take off her "mother button." She faced the end of life (from melanoma) with a sharp mind and grace that I hope I can emulate when it is time for me to face the challenge of that same transition. Today is Sunday, so we have new photos on our Viva la Voyage travel photo site. This week we are showing photos of the high Atacama desert of northern Chile. Let's go back to the beach for a while with my next series of photos. This is a photo of a wave crashing against some of the volcanic rocks on Langosta Beach, near our condo. The waves and the rocks produce the constant sounds of the surf that we enjoy providing a form of background music of the ocean for us to listen to from our condo. This week we have photos of Bhutan, featuring Buddhist festivals, on our Viva la Voyage travel photo site. This photo shows workers heading for a commuter bus that travels between Tamarindo and Santa Cruz, which is the nearest large town, about 30 minutes away. The houses and other photos that I have been showing during the last couple of weeks are typical of the scenes along the unpaved road that is the most direct route between Tamarindo and Santa Cruz. I think it is excellent that they have frequent, comfortable bus service from the nearest major town, with stops in the rural villages along the way. People want and need jobs in the tourism sector of the economy, and hotels, restaurants and shops need workers. Like many tourist resort areas, the prices of condos and houses in Tamarindo are too expensive for local service workers. The buses are a good solution. Some readers left favorable comments a week or so ago saying they liked seeing photos of the typical houses in the countryside. Here is another photo of some Tico houses. These houses share a driveway and they would make a very pleasant place for members of an extended family to live near one another. 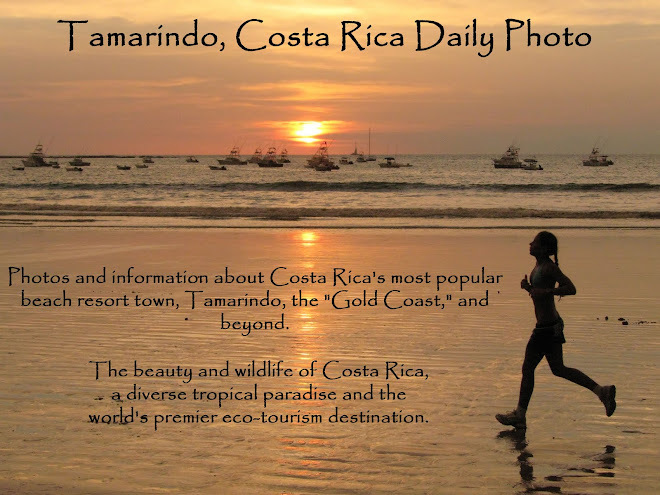 Tomorrow I will show how people who live in areas such as this get to work in the tourist industry in Tamarindo. It is not a surprise that you don't see any goats, horses or other creatures in this pasture. I also kept a safe distance, on the other side of a barbed wire fence. I don't mess with bulls. Julie's family has had a ranch in Navajo County, Arizona, since the 1880's, when they arrived in covered wagons. A bull on their ranch trapped Julie's brother in the house not too long ago, when something upset the bull. Every time her brother tried to come out of the house, the bull acted like it was ready to charge. This is another pastoral scene, featuring goats. The lush green pasture provides plenty of food for the goats. They coexist with cattle and horses in this field. They looked to busy eating to pay attention to me taking photo. I don't think anyone has accused goats of being shy about eating. This is a closer view of the pasture that I showed yesterday. It was used primarily by horses, although there were a few cows in the pasture also. I assume that the farmers or ranchers whould only need enough horses to ride around their farm or ranch while doing chores. I don't know why farmers would need to have a pasture full of horses, unless they are raising and selling horses, or unless they simply like having horses because they enjoy the ir companionship and they respect their magnificence. This is a photo of a pasture near the houses that I have been showing recently. Although most people come our area of Costa Rica to enjoy the beaches and the ocean, I like the countryside as well. The lush, green pastures and hillsides are soothing to the eyes, especially during the green season, from April through November. Today is Sunday, so we have new photos posted on our Viva la Voyage travel photo site. This week we are showing photos from our recent trip Bhutan, featuring photos of the first Buddhist festival of the year. OK. I admit it. This is goofy. My wife has been showing photos of Camelback Mountain near our Scottsdale, Arizona home on her Scottsdale Daily Photo site during the past few days. This is my attempt to replicate Camelback Mountain from sand and shells on the Langosta Beach. I took this photo for an art project. Julie and I belong to an art group that meets at our house every 6 weeks or so. It is like a book club, except each member creates a work of art about the same theme. One of our themes was Camelback Mountain. It always amazes us that people have such different interpretations of a common theme. The creations of our art group are posted on our friend's the leafdogart.com website. Some of the members of our group are talented artists, and others like me have a "day job" and tinker with art on our free time, but I do not delude myself into thinking I have talent. Our good friend Sharon of Phoenix Daily Photo is another member of the group. Several local galleries in Phoenix have hosted exhibitions of the art of our group. We are also thinking of starting a website to share the concept to help others who might want to start a "it's better thana book club" art group. This week we are showing photos of some of the temples in Siem Reap, Cambodia, including Angkor Wat, on our Viva la Voyage travel photo site. The house at the end of this driveway is where a tour guide lives. The vehicle parked outside is a small van with a sign on it that says "Tourismo." These are the type of vehicles that come to Tamarindo each day to pick up tourists and to take them to wildlife river trips, zip line adventures, or other activities. Tourism is the number one industry in the area. Costa Rica is a country of about 4 million people, which attracts more than 1 million visitors per year. The Pacific beaches are a major tourist destination point. In addition to people working as tour guides, of course the hotels, restaurants and shops employ lots of people. This photo shows another typical Tico house. This is a little larger than usual, and there is a window air conditioner. There is a chicken in the front yard, which is also not unusual. Costa Ricans like to preserve their agricultural traditions, even if people are earning their living primarily in the tourism industry. Tomorrow I will show an example of one of the benefits of the tourism industry for local residents. While I am showing some photos from a country road near Tamarindo, I will show a few photos of typical houses, such as this one. I like the colorful nature of many of the houses. By U.S. standards, they are modest, but they are usually well maintained, are comfortable, and quite adequate. Today's worldwide Daily Photo theme is "Bakeries." This photo shows the Bakery of Paris, and the photo below shows the inside of the shop. Nor surprisingly, the sign is in English, not Spanish, as the market for Tamarindo businesses are visitors from the USA and Canada. Not surprisingly, the name of the bakery invokes Paris. Would the bakery seem as appealing if it were called Bakery of London? I don't think so.